Stories and culture Building Bridges Breaking Walls One Story at a time. Inanimate objects have a way of jumping to life when a story is woven around them. It is simple, isn’t it? Context determines the attention that we give to an object. When we get to know more about the context, the object jumps to life. There is much power in stories. In fact, paying attention to stories and culture will help us live rich lives. The other day, my mom bought a saree and gave it an affectionate caress and whilst marveling its intricate pattern said, “that’s 41 years of experience that’s got this out”. Intrigue got the better of me and I soon found this card with her. This card came with the saree, she said. Whoever had thought about it, has a brilliant mind. Truth be told, my appreciation of sarees is next to zero and the role often is limited to being the man in tow, when a saree is being bought. The card helps me view the saree as a product of human effort now. An object that I can relate to much better. That there is power in stories is a given. In the above instance, the saree, an inanimate object, came alive to me because of the added context. A human being with all life experiences is a carrier of stories. A power-packed repository, if you will. So power packed that tapping into them can completely alter the perception about the person. Often times, bringing alive our own biases and themes in our mind. Lincoln, once famously said, “I don’t like that man. I must get to know him better”. 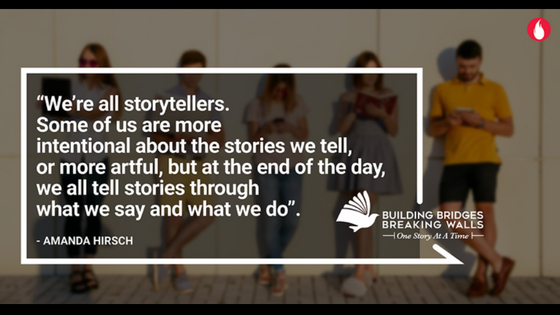 If stories are at the heart of it all, it is conversations that bring them alive. In whichever form or shape, it is conversations that are active carriers of stories. In the ‘everything-needs-to-be-measured-binary-digital-transactional-world’, conversations have been reduced to transactions. The richness that lies nestled within us evaporates like the hope expecting parents had for a stillborn child. Edgar Schein, who I have written about earlier, through Humble Inquiry and Humble Consulting espouse practical ways of empathy and connection. A connect that has curiosity, discovery, and conversation as basic tenets to build on. As I interact and work with leaders across the board and around the world, there is one thing that emerges ever so clear to me. The ability to create the climate for conversations to thrive is a competence modern day leaders must work on. There is much work that needs to be done in this space. Therein lies the space for us, our stories and our conversations. Is there anything that we can do in our daily lives to be able to foster this. A bunch of things stand out for me. Here are two. These need to be expanded on. 1. Take on less: Keeping empty spaces in the calendar is, in the modern times, seen as inefficient planning. For all those who run a “return on investment” calculation on conversations: Returns that come from deep conversations are non-linear, long lasting and disproportionate in the long term. To go deep is necessary to expand. 2. Deep conversations have a lot more to do with questions, deep listening, and curiosity than sharing. Not that sharing is not important. Just that it becomes a natural part of evolving conversation. Here is a fantastic blogpost that I discovered. Titled “52 Questions to Bring You Closer Together“ it is a keeper. I love the methodology behind the questions as much as the questions themselves, for it has lead me to work on and add on to the list. Come September, along with my friend Stephen Berkeley, I am running a one day workshop titled “Building Bridges Breaking Walls, One Story at a time” in Osaka. At the Asia Conference of the International Association of Facilitators, we hope to stir some conversation. Just as we did last year in Seoul, South Korea. The workshop last year got us some feedback that flattered us beyond our imagination. Sitting at the lobby of the hotel in Seoul, still chuffed by the kind words that participants had for us, we promised ourselves last year that we would think through and prompted us to think and offer a more holistic offering. That’s exactly what we have put together for this time. For starters, we have gotten a lot more committed to the idea of encouraging a greater coming together. We intend continuing this conversation well into the future. Through portals, platforms and one conversation at a time. We are aware that the role of leaders in creating a space for genuine deep conversation is something that we seek to explore even more. That this conversation must develop is something that we are convinced of. In organisations, communities, civil society and every other place, people have to be able to sit down and talk to each other. And hear each other out. The times we live in has seen building walls of all kinds catching the fancy of the world. But if we were to fancy our chance of passing the planet on to generations that come, we have to invest in our each other. Through our stories! We look forward to your support. We will keep try and aggregate our thoughts under the #story2story hashtag. Please dive into the conversation. In the meanwhile, listen to someone’s story. You never know what it can do to you. Or to them.